Now that Wonder and Whiskey: Insights on Faith from the Music of Dave Matthews Band has officially been released into the world, here are my answers to what I presume are some of the most common questions that people might have about it. Why does this book exist? The short answer is: because one day I said, "Why not?" The longer answer goes like this: On a whim, I put together a proposal for a book focusing on DMB for a theology and music series that a division of Wipf and Stock is putting together, figuring that I knew their catalogue thoroughly enough that I could easily contribute to what this group was doing. I was told that my approach didn't quite fit with their intent, but I was encouraged to submit my idea separately. I did, and then didn't hear anything back for what seemed like forever, so I figured it wasn't going to happen. And then out of the blue one day, it did. Okay, but why Dave Matthews Band now? It's been a long time since "Crash Into Me" and "Ants Marching." Even if their newer songs don't get the same amount of radio play that their classic 1990s singles continue to enjoy, as of 2016 they are still one of the highest-grossing tour acts in the country. And they're more known and loved for their live shows, anyway. So even though their studio efforts have not garnered as much attention the last decade or more, they remain one of the most popular bands out there. So this sort of book is as relevant as ever. I'm not a fan of this band. Why would I want to read this? The music of this band deals with living in the moment, enjoying the gifts of this life while also guarding against overindulgence, being active in helping others in need, calling out the dangerous side of institutional religion, and following the ethics of Jesus, among other issues. Even if you have never cared for DMB's music, you'll be able to find plenty in this book that is resonant with what faithful living looks like beyond doctrinal platitudes, presented in a unique way. I'm a fan of the band but I'm not a Christian. Why would I want to read this? I think that the problem with a lot of "Gospel According to [Pop Culture Thing]" books tends to be one of two related issues: 1) They don't delve deep enough into the source material to really let it lead the discussion, and/or 2) They use said source material as a marginal prop for what they were already planning to say. I tried to be as conscious of both these problems as I could, and began with the band's catalogue rather than tried to use their lyrics as "proof texts." I mean, it's bad enough when people use the Bible that way, and I respect this band's art too much to treat it like that. But yes, the book is written from a Christian perspective, and does include quite a bit of Biblical references. But I started with the songs, and let them dictate the book's themes. The result is a lot of what I see as healthy critique of religious belief that can help lead people of faith into something more authentic, stripped of non-essentials, and grounded in the needs of this world and this life. 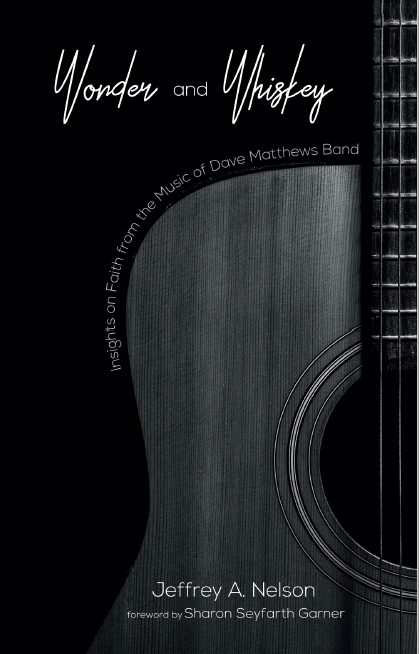 Readers who don't consider themselves Christian will hopefully see ways that DMB's music does have spiritual themes, and I hope that whatever each reader's path entails, they will find something in this book that enriches that in some way. There aren't any actual lyrics in here. Why is that? The basic answer is time and money. Gaining permission to reprint even a single line from a song can take a long time and can have a steep cost. I decided that it would be simpler to offer general descriptions of the songs' ideas rather than go through that process. Near the beginning I encourage readers to listen to each song on their own as they move through the book. To help readers with this, I've created a Spotify playlist of every song mentioned in the book, in the order in which they appear. You can check that out at this link. Where else can I keep up with book and author news besides this blog? I send out a monthly-ish e-newsletter that you can subscribe to here. I also provide updates on my professional Facebook page and on Twitter. Any plans for a release event? I'm doing a Facebook Live reading and Q & A on June 24th at 9 p.m. You should come. Hey, you have another book besides this one, right? Why, as a matter of fact, I do! And you can get it here. Thanks for asking!